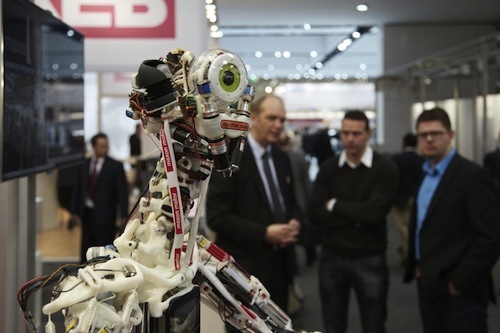 The eleven trade fairs staged under the umbrella of HANNOVER MESSE 2013 from 8 to 12 April featured the keynote theme of “Integrated Industry.” 6,550 exhibitors, highlighting a multitude of innovative products and technology solutions, provided a vivid showcase for this theme. The show’s five core topics – Industrial Automation and IT, Energy and Environmental Technology, Fluid Power and Power Transmission, Industrial Subcontracting, Manufacturing Technology and Services and R&D – opened up new prospects for expert dialogue across all aspects of Industry 4.0, or the fourth industrial revolution! There was strong European Union representation at the fair. The European Commission sent three commissioners to attend on different days as well as fifteen different delegations for various European Bodies and the European Parliament. The fair highlighted Russia during the week and welcomed the Russian President, Vladimir Putin, who accompanied the Chancellor of Germany‎, Angela Merkel in touring the fair on the first day. Industrial Automation featured process and production automation and system solutions for production and buildings. The “Integrated Industry” keynote theme was the dominant topic at exhibitor stands, and the debate on the “Factory of the Future” continued at the “Industrial IT Forum”. Leading robot manufacturers and system providers organized a “Parade of Robots”, while showcasing their latest production automation technology and solutions. Within the exhibition halls, trade visitors were able to view live displays of robots in operation. The process technology exhibition area provided comprehensive coverage of topics like pressure, filling level and temperature measurement as well as transmission and control engineering, along with a rich program of presentation and discussion forums. 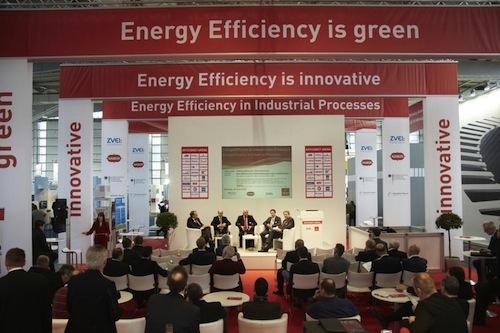 The Efficiency Arena moreover offered visitors a program of lectures and debates on all aspects of energy efficiency in industrial processes during the five-day event. • Hanover Fair First Impressions. MDA introduced Bosch Rexroth as this year’s HERMES AWARD winner, successfully highlighting the immense potential stemming from innovations in the area of electric and mechanical drive engineering, pneumatics and hydraulics. Bosch Rexroth received the award for a software solution perfectly tailored to the “Integrated Industry” keynote theme at HANNOVER MESSE. Generally speaking, the exhibitors at this year’s MDA focused on efficient and sustainable intelligent integrated system solutions. All the market leaders in the sector were at MDA, with displays including roller bearings, gears, clutches, hydraulic cylinders and subassemblies, filters, valves, sealing systems, oil supply systems and power electronics. The MDA show again included an accompanying forum for debate on current trends and technologies. Key topics this year were drive technology for wind energy plants, sealing systems, condition monitoring systems, along with sustainability, energy efficiency and lightweight construction. The leading-edge technologies displayed by Energy exhibitors illustrated their ability to make a real contribution to the global transition in energy systems. Exhibits covered the entire energy industry supply chain, from generation, grid supply, transmission, distribution and storage through to the latest IT and market mechanisms for smart grids. The focus was on potential savings and efficiency gains from decentralized energy supply solutions. This involved energy efficiency service providers and the entire cogeneration and trigeneration market segment, plus the decentralized grid supply stationary fuel cells featured at the Hydrogen + Fuel Cells pavilion. Smart grids were another major theme, with a dedicated theme park and an accompanying forum. The most popular HANNOVER MESSE forum was again “Life Needs Power”, where experts from policy, research and industry debated all the key trends and issues confronting the energy industry. Another major drawing card was the Renewable Energy forum, located within the same named exhibition sector. The forum featured informative presentations on wind and bio energy, photovoltaic systems, and solar and geothermal energy. Wind power is seen as the driving force among the various renewable energy options. Worldwide installed power has already reached more than 200 gigawatts, and the participants in the Wind flagship tradeshow were clearly there to talk business. The leading manufacturers, subcontractors, logistics specialists and service providers were on hand to present their new concept designs and technologies for on- and off-shore solutions, and they used the international industrial platform provided by HANNOVER MESSE to highlight their skills for the energy transition. Higher towers, larger nacelles, longer rotor vanes and more powerful transmission systems are making wind energy plants more powerful. Optimized plants for low-wind locations also have a part to play in making efficient use of wind energy. The Wind event again highlighted the enormous innovation momentum in this sector. The raft of new products and innovative solutions on display in MobiliTec made an impressive contribution to HANNOVER MESSE in terms of economic policy issues. As the flagship tradeshow for electric drive technologies, mobile energy storage and alternative mobility technologies, the event provided a comprehensive overview of electric mobility solutions. Among the exhibitors were regions whose projects have been selected by the German federal government for funding under the “Electric Mobility Showcase” program. Another highlight was the eMotive pavilion with cutting-edge electric mobility displays. The MobiliTec user forum drew big visitor numbers, with discussion and debate on the latest research findings and trends in energy storage technologies and powertrain electrification. Visitors were also able to test drive the latest electric vehicles on the extended circuit on the open-air site at the Hannover Exhibition Center. The European Research Commissioner, Máire Geoghgan-Quinn presented the new EU research framework program Horizon 2020 at the MobiliTec Forum on 11 April. She attended both in her European Capacity but also as Ireland’s Commissioner as that country holds the European Presidency during the first half of 2013. Digital Factory in Hall 7 was again the ICT hub at HANNOVER MESSE. The huge importance of IT as a driver of industrial innovations was reflected in the broad range of solutions on display, including PLM, ERP, MES and CAx. The key themes of the event were fully canvassed both in trade meetings and in the debates on strategy issues on all aspects of Industry 4.0. The industry associations VDMA (German Engineering Federation), ZVEI (German Electrical and Electronic Manufacturers’ Association) and BITKOM (German Federal Association for Information Technology, Telecommunications and New Media) have created an agency specifically for this purpose, which they launched at the fair. Exhibitor firms provided impressive examples of the integration of real and digital business environments across every facet of the “Integrated Industry” keynote theme and debated the specific challenges involved in maintaining the data flow from product design, production scheduling and production through to the service phase. A special highlight of Digital Factory was the first CAE forum dedicated to the topic of numerical simulation. Presentations by representatives of industry and academia addressed topics like “IT Services” and “Quality Assurance in Virtual Product Design”. Exhibitors at ComVac provided a complete market overview of their sector. 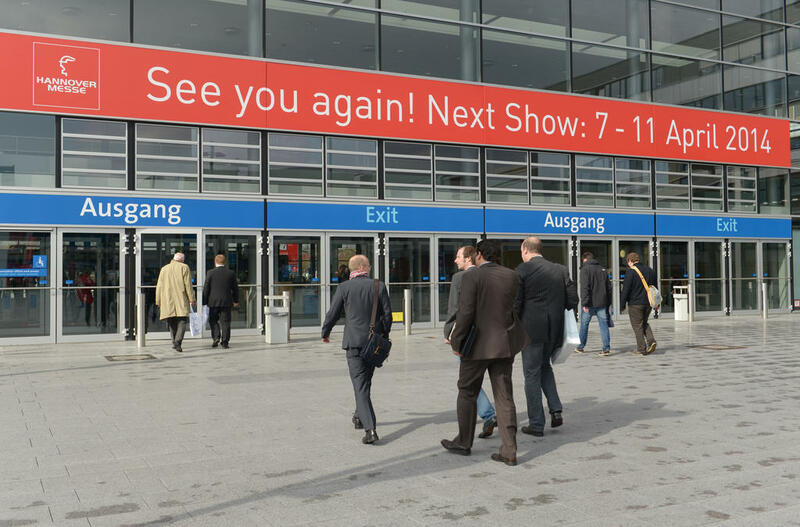 All the market leaders were back this year for the “odd-numbered cycle” at HANNOVER MESSE to display their compressed air and vacuum technology products and solutions – from generation and treatment to distribution and practical applications in systems and machines. The focus was on state-of-the-art solutions which consume significantly less electric power and are more maintenance-friendly, with lower noise emissions, adding up to clear efficiency gains in production operations. Other sector themes in high demand included the classic after-sales segments like maintenance, repair and service contracts and consulting and analysis. This included the simulation of compressed air requirements, leakage checks, and audits and evaluation of compressed air systems and finance options. The businesses exhibiting at ComVac all see compressed air technologies as an essential part of industry and skilled trades operations. The optimized hall configuration and comprehensive supporting program for the Industrial Supply event, particularly the Suppliers Convention and Materials Forum, were well received by exhibitors and visitors alike. As a worldwide global sourcing event, the Industrial Supply show staged in halls 4 to 6 clearly showed how closely the subcontracting industry is involved in its customers’ planning and production processes. They appreciated the synergies from the physical location near the venues for surface technologies, environmental technologies and R&D. The companies presented components and processes meticulously tailored to customer requirements, for intelligent integration into their production processes. This made a clear and very tangible contribution to the HANNOVER MESSE keynote theme of “Integrated Industry”. The Industrial Supply exhibitors impressed visitors with their wide range of applications and solutions-oriented products and technologies for functions like solid and sheet metal forming, machined components, systems and subassemblies, casting products and latches and locking systems, operating controls, fastening techniques and joining and adhesive bonding technology. Lightweight construction topics were again a special highlight. This technology is seen as providing intelligent solutions for sustainable efficiency improvements. Meanwhile, the first Wind Energy Suppliers forum focused on eco-friendly, resource-conserving production processes, competitive logistics, new materials and process engineering solutions and intelligent production technology. SurfaceTechnology 2013 showcased the entire value chain of application-oriented surface technologies. 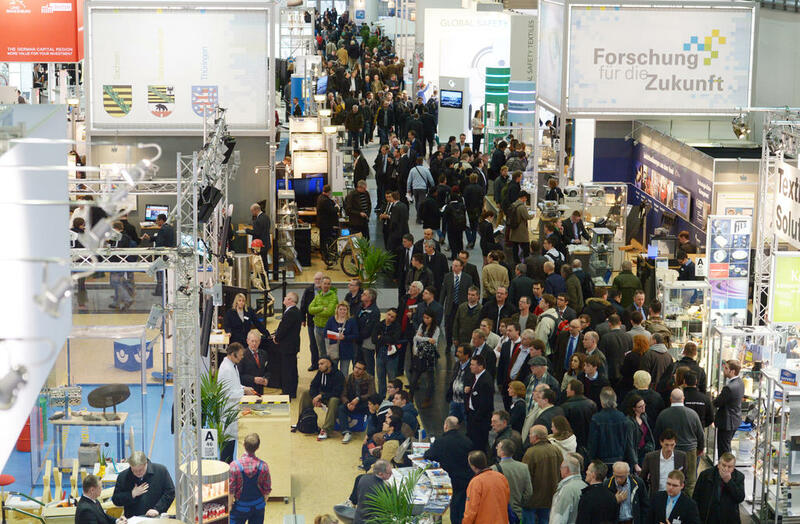 As a key technology segment with applications across all industry sectors, the surface technology industry derives full benefit from the HANNOVER MESSE concept, since it has customers and users in all the sectors represented at the event. The new SurfaceTechnology venue in Hall 3 was a success, providing more effective synergies with the adjacent Research & Technology and Industrial Supply shows. Visitors were particularly impressed with the pavilions and special presentations on topics such as painting technology or nano-based applications and processes for high-tech surfaces. The Surface Technology forum focused on the importance of surfaces in interaction with the respective base materials. The displays of IndustrialGreenTec exhibitors at events covering all aspects of environmental technologies focused primarily on the needs and issues facing SMEs from Germany and abroad. At a range of workshops and conferences, international trade visitors were able to learn from the pioneers of sustainable production processes. Special attention was given to best-practice examples in terms of resource efficiency and the conservation of natural resources. One of the event highlights was the IndustrialGreenTec Conference, centered around the practical implementation of sustainable production processes and how businesses can benefit from them. Technology transfer and partnerships between research and industry were in the spotlight at the Research & Technology show. The exhibiting institutes, universities and companies were in Hall 2 to dialogue with industry and political representatives on the new technologies and improvements that will be needed to successfully address the challenges facing industry. The main focus was on the HANNOVER MESSE keynote theme of “Integrated Industry” and Industry 4.0. The “tech transfer – Gateway2Innovation” showcase put creative innovators in touch with business decision-makers and others looking for new ideas. The Research & Technology thematic clusters, such as Adaptronics, World of Nano, Bionics, Organic Electronics, Textile Solutions and in the R&T Arena clearly illustrated the potential benefits for industry stemming from the research and science domain. This entry was posted on Monday, April 15th, 2013 at 10:26 am and is filed under Automation, Events, Green Issues, Instrumentation, Marketing, Process Automation. You can follow any responses to this entry through the RSS 2.0 feed. You can leave a response, or trackback from your own site.